Hi everyone! I hope you are having a nice month so far. I have three layouts featuring the beautiful Tattered Walls Collection to share with you for June. My first one is "Make Your Own Path". 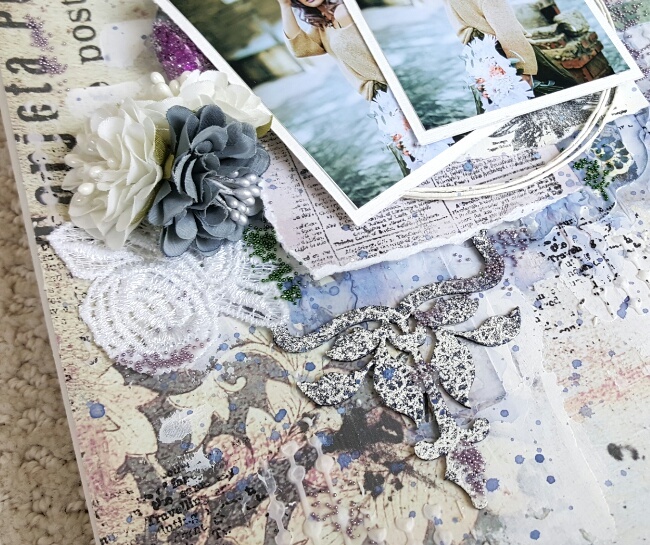 The background paper is Suite 204 from the Tattered Walls Collection. Using matte gel, I used the Tattered Walls Ephemera in areas around the picture then lightly covered them with gesso to blend them into the background. I love the new For the Birds Stamp in the Tattered Walls Collection. I used the music notes from the stamp set on my background. 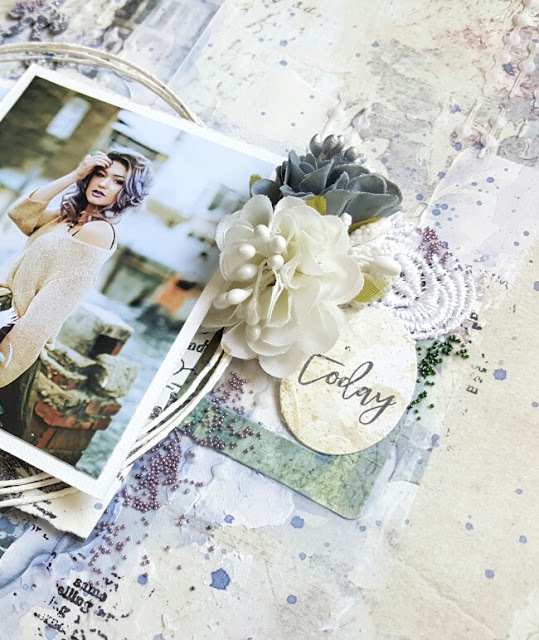 You can also see I created my own matting for the picture using Blue Fern Studios Stamps: London Chronicles Stamp and Journaling Cards Stamp then distressed the papers. 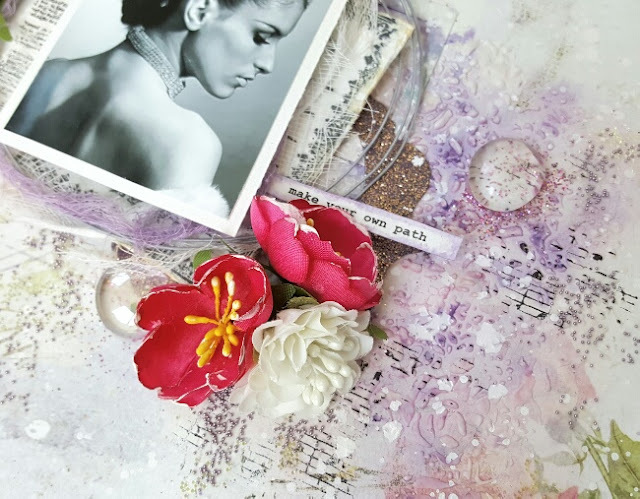 The white flowers you see are from the Spring Blooms set and the pink flowers are from the Summer Blooms set. I love the new colors of seedlings for this collection! For my layout, I used the Lavender seedlings and Lemonade seedlings lightly spread across my page. I really love how the Lemonade seedlings are slightly transparent - they really add softness to a page. You can also see the pretty new glitter Gilded Rose. The frame on this side of the picture is actually a piece of the Tattered Walls Ephemera embossed twice with Napa Valley Embossing Powder. The two pieces of chipboard shown below are from the Classic Mini Frames set in the Tattered Walls Collection. They are both embossed with the new Napa Valley Embossing Powder. 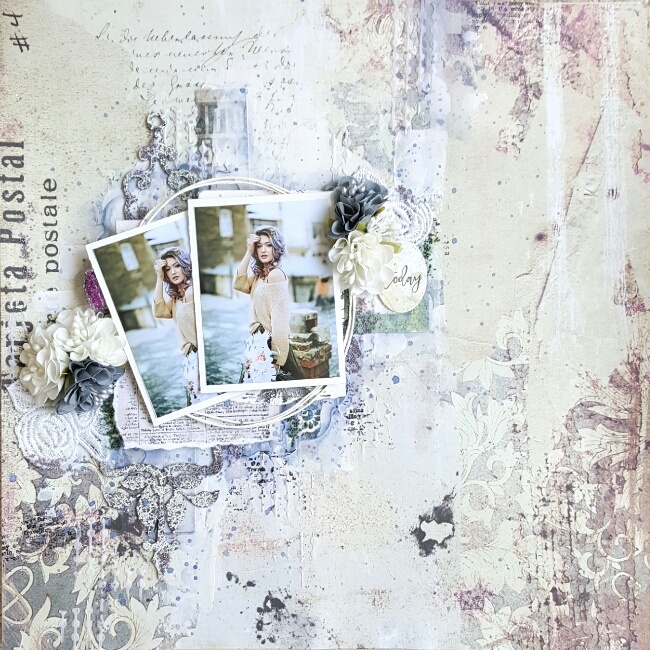 My second layout also features the Tatted Walls Collection. My background paper is The Carpet. I adhered the Tattered Walls Ephemera with matte gel to the background paper and added areas of gesso over them. 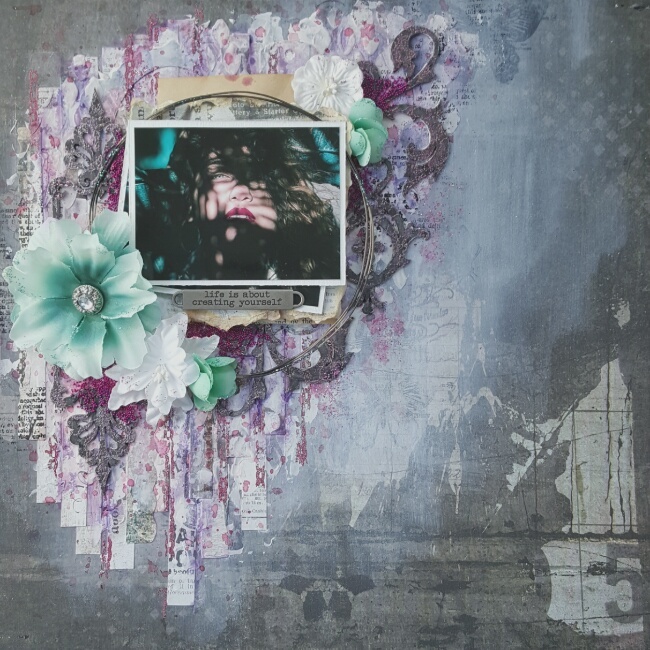 In addition, I used the Tattered Newsprint Stamp randomly on my background. I created the matting behind the pictures using Blue Fern Studios stamps: London Chronicle Stamp and the new Flutter Music Stamp. 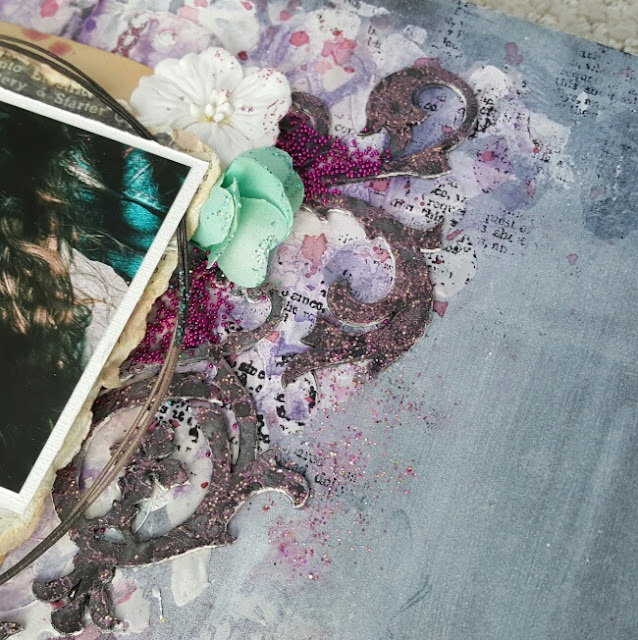 I love the new Embellished Frame Chipboard piece that I used behind my pictures. I cut it in two pieces then embossed it with the gorgeous Sparkling Navy Embossing Powder. Then I used the Crackle Texture Stamp and embossed the design with the Ivory Embossing Powder. The white flowers on my layout are from the Spring Blooms set, while the blue flowers are part of the Heartland Blossoms set. Here you can see a piece of the Lace 7B behind the flowers. The green seedlings are Fir Tree and the purple are the new Lavender Seedlings. The purple berries piece behind the flowers are from the Spring Peony and Berries flowers set. Finally, here is a closer look at the bottom half of the Embellished Frame Chipboard piece with Sparkling Navy and Ivory Embossing Powders. My final layout for June uses the Tattered Walls Collection in a dramatic way! At the end of this post I added an outline of how I created my background. The paper is the back side of the Suite 204 paper. The butterflies on my background are from the Flutter Music stamp. I cut Tattered Walls The Reading Room Paper into strips and used Tattered Walls Ephemera as a base for my background. You can also see I ripped The Reading Room paper and used it as matting behind my picture. The chain designs are from the For the Birds Stamp set and I embossed them with Napa Valley Embossing Powder. The Tattered Newsprint Stamp was also used with black solvent ink randomly on my layout. The pink seedlings on my background are the new Maroon Seedlings. 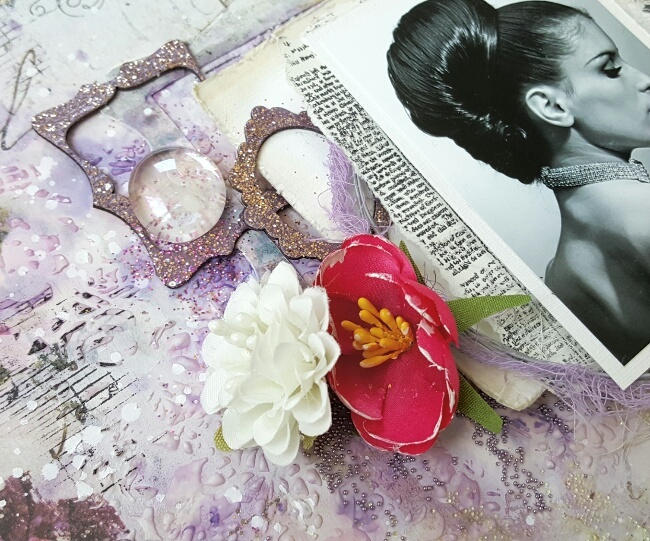 I also added small amounts of Gilded Rose Glitter in areas on my background. I cut the Briella's Mini Frame Chipboard into two pieces for the left side of the picture. For the chipboard on my page, I applied two coats of gesso first. Then I used the Crackle Texture Stamp with Napa Valley Embossing Powder to emboss the design. I then painted over it with black watercolor paint. The large flower is from the Spring Peony & Berries Set. I took apart the flower in the set and made a smaller version of the flower from the top three sections of petals. 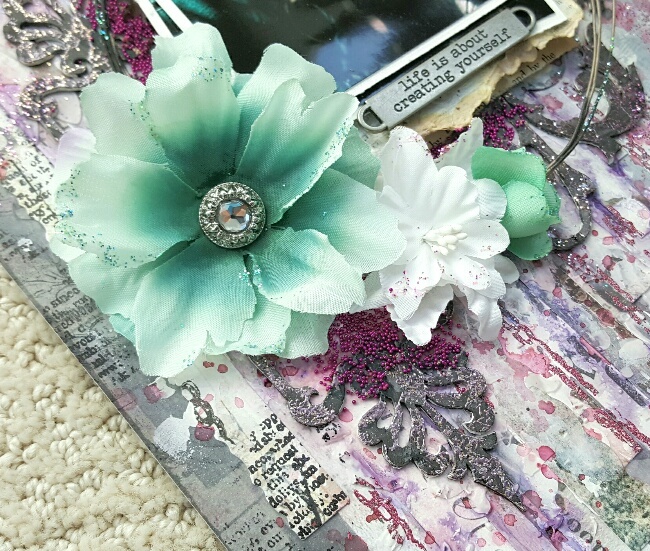 The other teal flower is actually a set of petals from a flower in the Summer Blooms Set. I took apart the flower and folded it to make it look like a little rose bud. The white flower here is from the Homespun Blooms Set. I added Gilded Rose Glitter on the white flower and Marine Glitter on the teal flowers. 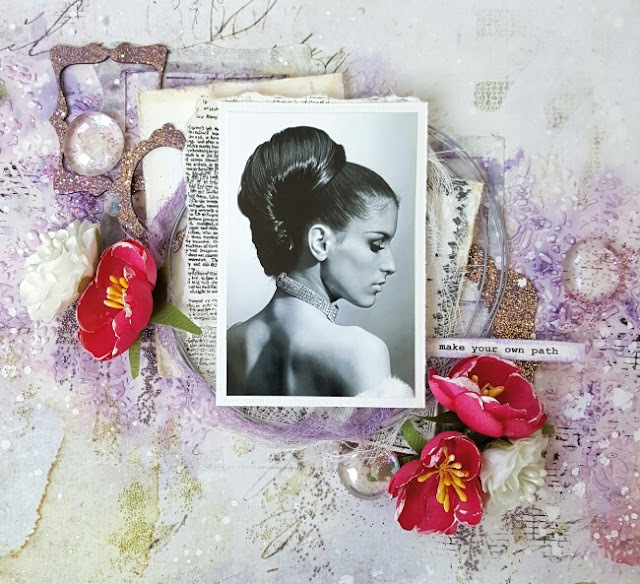 In this picture, I used the Elegant Flourish Chipboard piece and cut it into three different pieces to use on the right side of my picture. 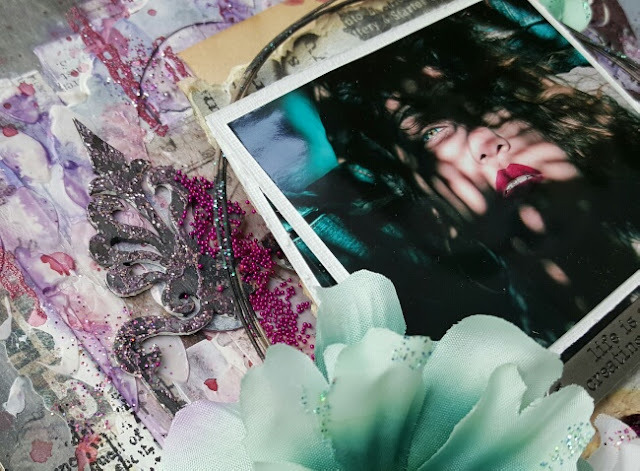 The white flower is from the Apricot Blooms set and I made another teal rosebud for the right side of my picture from the Summer Blooms set. To begin, I chose the Tattered Walls Suite 204 paper, covered it with clear gesso, then used the Flutter Music Stamp with a black solvent ink pad to add the butterflies on the background. To soften the butterflies, I applied diluted gesso on my background. I cut the Tattered Walls The Reading Room paper into strips and adhered them and some Tattered Walls Ephemera with matte gel. After that, I used a pallet knife and randomly added gesso over the strips of paper. Next I chose a stencil with modeling paste to add more texture. Using several shades of pink and purple mists, I outlined parts of the strips of paper and spritzed it with water to let the ink run a bit. I let it air dry then used a pink mist to splatter over my page and I let the splatters air dry. To soften some of the splatters, you can spritz water on them while wet. Then I used the Tattered Newsprint Stamp with a black solvent ink pad in several places on my background. Finally, using the chain from the stamp set For the Birds, I embossed the design up and down the page with the new Napa Valley Embossing Powder. 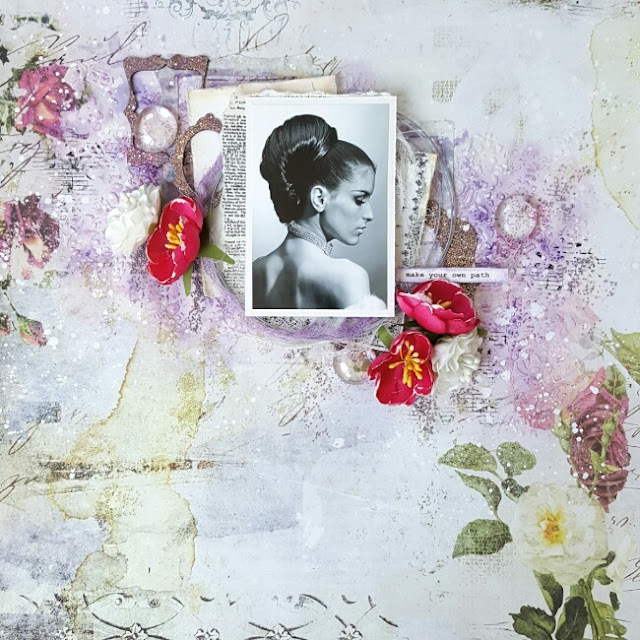 I hope I gave you some inspiration for this gorgeous new Tattered Walls Collection! Have fun creating! 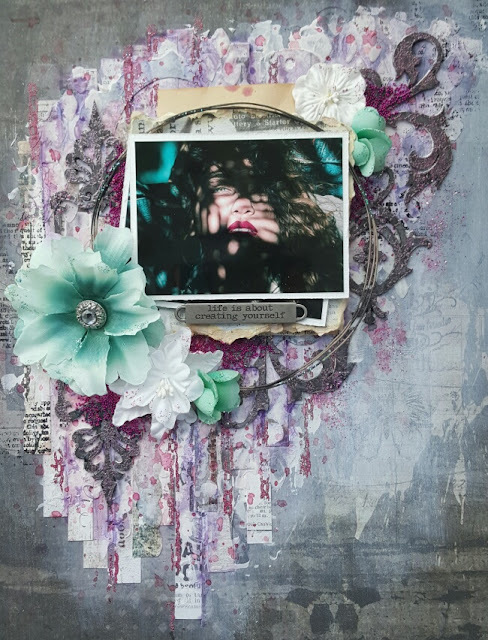 June "Tattered Walls" Pages by Sharon!